The Vectra 3D allows us to educate our patients in the best way possible. It captures face images in ultra-high resolution 3D, and lets you see the exciting possibilities of your simulated aesthetic procedures. 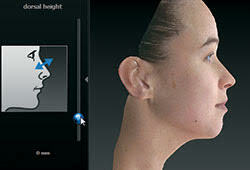 With Vectra, you can visualize how you will look after your procedure, from every angle with volumetric facial analysis. The Vectra 3D imaging system uses multiple cameras to take high-resolution photos from several points of view in order to create a virtual 3D model of your face on the computer monitor. This process is done in a private consultation setting and the entire scanning and sculpting process used by the imaging system takes only a few minutes. The images obtained by the Vectra 3D system allow you to view the probable results of your surgical procedure without having to go under the knife first. This creates clear communication between you and Dr. Parsa, enabling him to make any necessary adjustments before surgery so that you can achieve the results you are expecting. We only use the most advanced technology available to help fulfill your cosmetic needs and help you achieve the results you are looking for. If you would like to schedule a Vectra 3D imaging consultation with Dr. Kami Parsa, please contact us at (310) 777-8880 or fill out the contact form.